1. 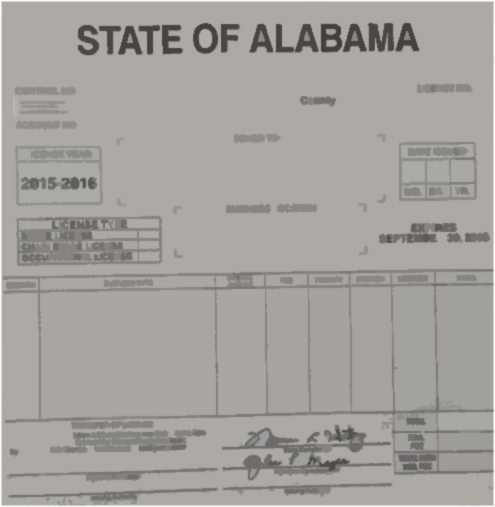 Surrender the Alabama title, properly assigned to the new owner by the executor or executrix. 2. Provide certified copy of the letters of testamentary regarding the vehicle. (If the estate requires probate and there is no will, then a certified copy of the probate proceedings or letters of administration may be provided). 3. Executor, or executrix, or administrator should sign the title assignment with the same name style as listed on the copy of the letters of testamentary. 1. Surrender the Alabama title, properly assigned to the new owner by the deceased owner's next of kin. 2. Provide the completed State Form 5-6 (Affidavit for Assignment of Title For A Vehicle When Deceased Owner Dies Without A Will). 3. Provide certified copy of the deceased owner's death certificate. 4. The family member designated as 'next of kin' should sign the title assignment with the same name style as listed on the State affidavit. 5. If there is a will, and it is not probated, then the deceased owner is considered to have died intestate.